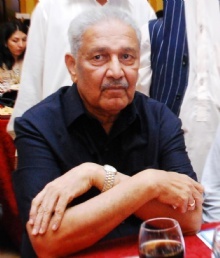 Abdul Qadeer Khan (born in Bhopal, British Bhopal, British Indian Empire (Present day, India)), he is also known as Mohsin-e-Pakistan, is a famous Scientist from Pakistan, he is 83 years old and still alive, born April 1, 1936. Abdul Qadeer Khan (AQ Khan) is a Pakistani engineer. His middle name is also written as Quadeer, Qadir or Gadeer. He is best known for starting Pakistan's nuclear weapons program, which helped Pakistan to create nuclear weapons. In January 2004, he admitted his secret involvement in the proliferation of nuclear technology from Pakistan to Libya, Iran, and North Korea. In February of that year declared Pakistan President General Pervez Musharraf that he had pardoned Khan, who is seen as a hero at home. Khan has also argued that China helped Pakistan to produce two nuclear weapons 1982nd. He is born under the zodiac aries, who is known for Active, Demanding, Determined, Effective, Ambitious. Our collection contains 8 quotes who is written / told by Abdul. "I have to ask Allah's forgiveness and not get angry, because they come to me out of love, and it's not fitting that I should turn to them in hatred"
"Hatred, intolerance, poor hygienic conditions and violence all have roots in illiteracy, so we're trying to do something to help the poor and the needy"
"Some people are ok with doing nothing all day after they retire, but then some people if they had nothing to do would go mad and start banging their heads against a wall"
"People go out of their way to show the love and respect for me. It is very gratifying"
"I am proud of my work for my country"
"No money on earth can buy the love and affection that has been given to me by a grateful nation"
"Well, sometimes if I go out to dinner with my family, people will come up to me and put their hand across my plate for me to shake, sometimes when I have a bite of food in my mouth. I find this a bit disturbing"
"I am not a madman or a nut"